A quick look at some options for streaming audio books. A system that plays any audio format. A way to play books on multiple platforms, iOS Android and web browsers. Current location stored and honored across platforms. The ability to play audiobooks at different speeds. An easy way to access my entire library remotely. Several options come close. My favorite Android audiobook app, for instance, is "Listen", available in the Play Store. But, it falls short on the multi-platform front and also on accessing books remotely. Audible itself will do most of what I need, but it doesn't allow importing remote books. And, traditional music players are out. Honestly, Plex seems like the perfect platform for audiobooks. And although some people do use it, they're just kludging things. Plex doesn't natively support the concepts behind audiobooks, so the process isn't smooth at all. I'm honestly hoping that changes in the future, because it would be a perfect addition to an already amazing system. Thankfully, in the meantime, there's BookSonic. will get BookSonic running on your Docker host. Once it's installed, just head over to http://docker_host:8080 and log in as admin/admin. You can start the book scan, and fairly soon, your books will show up for you to start playing! 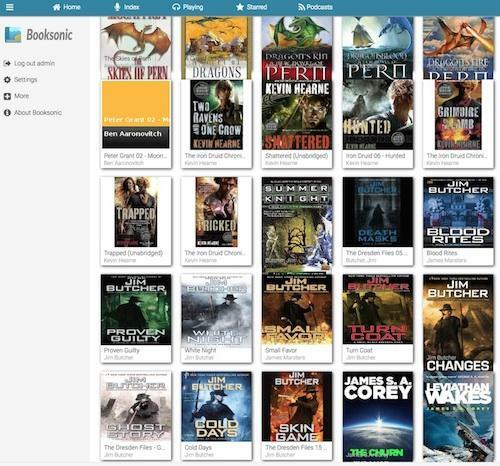 Many things about BookSonic do need work (syncing locations to the web client and so on), but it's a great start, and it's a wonderful way to access all your books in one place. Well, as long as you figure out how to strip the DRM from your Audible books anyway! For more details, head over to http://booksonic.org.